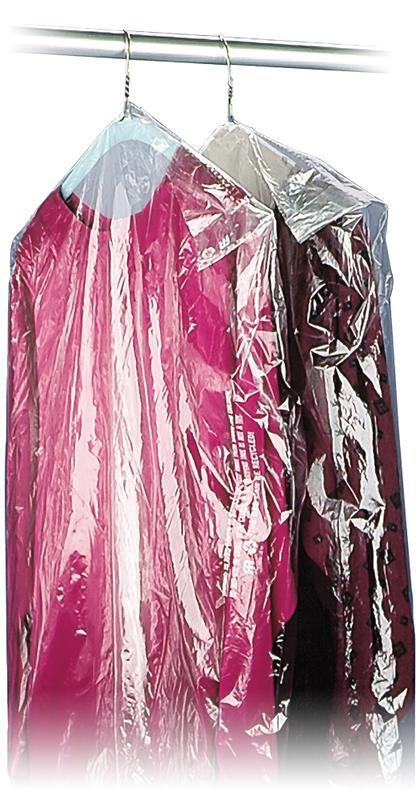 These Clear Poly Dry Cleaning Bags and .5 Mil Clear Plastic Garment Bags on Rolls are made with hanger holes, sloped shoulders and come on a roll for easy dispensing. We can even put a custom print or logo on Custom Printed Dry Cleaning Bags On Rolls of the size of your choice. Plastic Dry Cleaning Garment Bags on Rolls are perfect for protecting everything in a common wardrobe and keeping them wrinkle free!. 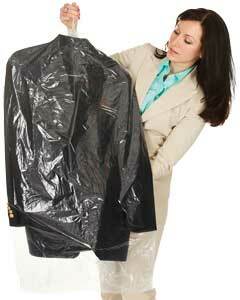 Our Dry Cleaning Bags can also help keep a bride's wedding gown free from dust. Cover everything from formal wear, full-length coats, evening gowns, cocktail party attire, shirts, and suits, they can accommodate almost any need. Plastic bags for dry cleaners are sold by the roll. Clear .5 Mil Plastic disposable garment bags on a roll are sometimes referred to as Garment Film or even dry clean plastic covers.